There are days when I just want to KISS in my kitchen... ok, you naughty minds, I'm not puckering my lips, I meant KISS as in Keep It Simple, Stupid! On such days when I want to prepare something quick, uncomplicated & delicious, I love to make Chipotle Cilantro Lime Rice. Simple, scrumptious, satisfying - it is the perfect comfort food! Like countless others, I am a huge fan of Chipotle, the Mexican fast-casual restaurant chain that's uber-popular in US for its delicious mexican food. 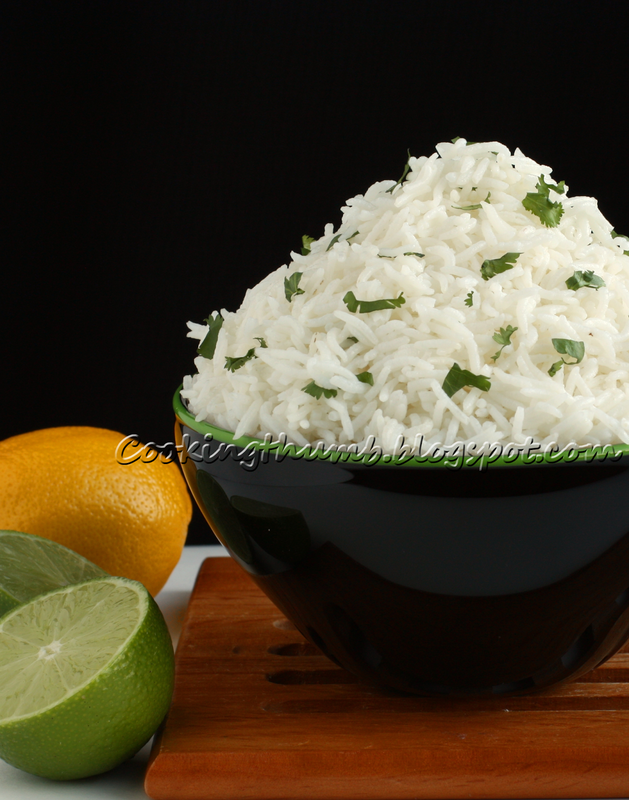 And I could swear by its Cilantro Lime Rice - the fresh cilantro & tangy lime infuse light, citrusy flavors into the fragrant, long-grained basmati rice that bring the entire dish to life. Add the Cilantro Lime Rice to a burrito or a taco, or serve it with your favorite veggie stew or grilled meats... either way, it is a great versatile side dish that will brighten up your entire meal and make it delicious & wholesome. Rinse rice till water runs clear. Drain the water. Keep aside. In a medium saucepan, bring the water to a boil. Add salt, bay leaf & rice. Reduce the heat to simmer (I set it to mark 3), cover & cook for 15 minutes or until all water is absorbed. Remove from the heat. Let cool for 5 minutes covered. Remove the Bay leaf. Add oil to the cooked rice. Fluff rice with a fork. Let it sit for another 10 minutes uncovered. Pour juices over the rice & fluff it with a fork. Sprinkle in cilantro just before serving, toss well & serve. Chipotle uses Soy oil for this recipe. However, if you do not have soy oil, then you may substitute it with Canola oil. I have tried this recipe with Canola oil & it came out equally good. wow thats a delicious replica of chipotle cilantro lime rice :) looks yumm dear ! !